Cakes and breads can be quite similar. They are both carbohydrate heavy foods that must be baked in order to be eaten. Despite their similarities, there are also some major differences between the two. The first is in the ingredients used to prepare both. A bread, like a cake, will include flour as its primary ingredient. However, it also includes a leavening agent, usually yeast. [i] Other ingredients found in a bread could also include salt, water, corn syrup, or even a small amount of oil. These same ingredients could potentially also be used in a cake but a cake might also include eggs, sugar, milk, flavored syrups or cocoa. [ii] This means that a cake will usually have the addition of a protein source as well as a sweetener. Also, cakes tend to also have frosting as a topping, which is something that a bread would lack. When preparing a cake from scratch, like bread, you must first mix the ingredients together. However, this is a graduated process. First, start with the butter or oil and sugar. These must be mixed together for about three to five minutes until they become light, fluffy and creamy. Once they reach that stage, you must add the eggs one at a time. They act as an emulsifier to the batter and it is better if they are at room temperature as cold eggs will appear curdled. Then you will add the powdered ingredients (typically a mixture of flour, baking powder and salt) and milk. Start with half the powder mixture, let it mix in for a bit, then add the milk, mix it for a bit, and finally add the rest of the powder mixture. Doing it like this will create a smoother, more integrated batter and will ensure that there are no dry pockets. Finally, you may pour it into a cake pan and bake it for the necessary amount of time. 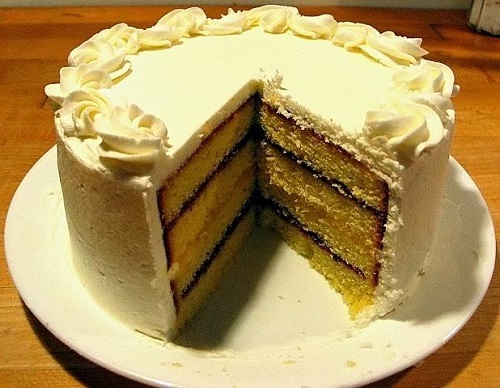 A good rule of thumb is that it will be done when a toothpick can be inserted in the center of the cake and will be clean when it is pulled out. [iv] Once it cools, frosting or icing can be added to the cake for decoration and enhanced flavor. There can be minor variations to this process for both cake and bread, but in general, this is the basic process for both and it is marked by very different features. Again, because of the differences in ingredients, the nutritional value of both bread and cake varies greatly. The average amount of calories in a regular piece of bread would be approximately 69. This is in stark contrast to cake, which would typically contain about 235 calories per slice if frosted. [vi] This is an almost fourfold increase. Rikki Roehrich. "Differences between Cake and Bread." DifferenceBetween.net. November 21, 2016 < http://www.differencebetween.net/object/comparisons-of-food-items/differences-between-cake-and-bread/ >. Can you provide the sources please?